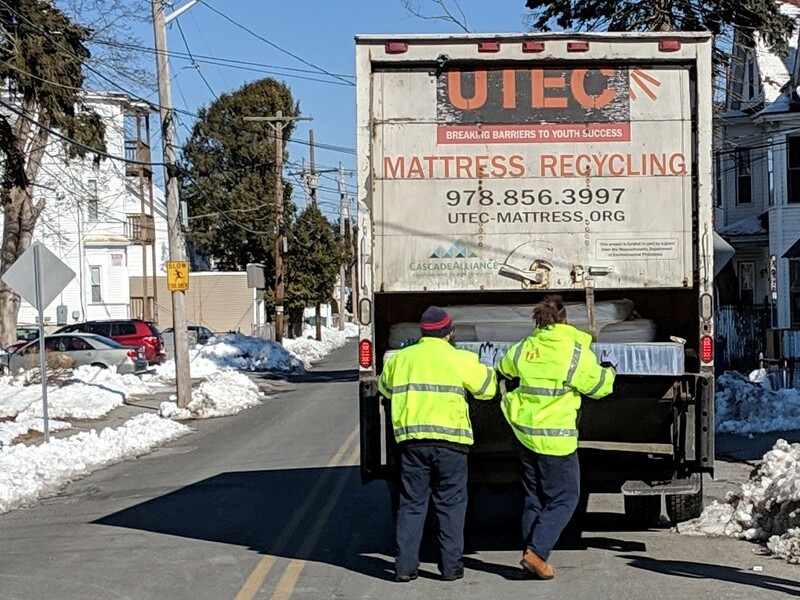 The City of Cambridge has partnered with UTEC, a nonprofit organization serving proven-risk young adults, to provide free weekly curbside mattress and box spring recycling services. Approximately 100 tons of mattresses are trashed in Cambridge each year, taking up a massive amount of space in landfills compared to other waste. This initiative will support the city’s goals of reducing waste and is launched in accordance to guidelines from the City’s Zero Waste Master Plan. “This program will build upon our current waste diversion programs. By scheduling a pickup, you can divert mattresses from clogging landfills, while helping an outstanding social enterprise,” said Owen O’Riordan, Cambridge Department of Public Works Commissioner. UTEC will pick up, deconstruct, and recycle mattresses. The textiles and foam will be recycled into new carpeting or padding. The steel will be melted and recycled into a new steel product. Residents can begin scheduling on March 29 and collection will begin April 4. The program is partially funded by a grant from the Massachusetts Department of Environmental Protection. More about UTEC: Mattress Recycling is one of three social enterprises that offer paid work experience as part of UTEC’s intensive programming for young adults. UTEC is dedicated to helping young adults ages 17-25 overcome the very real challenges of poverty, gang involvement, unemployment, and cultural barriers that are pervasive in our communities. When these young adults succeed, the community sees the greatest positive impact on public safety, public health and economic development. To learn more about UTEC’s mission and its social enterprises, visit www.UTECinc.org.